So Robert Benchley cabled home to his New York publisher in the 1930s. An awareness of Venice’s obvious difference is only the beginning of understanding how this city is made. How would you build a city on a sheet of water? The Venetians started with a collection of tiny islands, the Realtine archipelago, including the sites of San Marco, the Rialto, and San Pietro di Castello. Over the centuries, they gradually filled up the spaces in between; the quartiere Sant’Elena, on the eastern tip of the city, is one of the newer additions. On a good map, you can see how the city is split into roughly uniform ‘blocks’ divided by the canals. On each of these is one or perhaps two squares (campi) containing the parish churches. This is the basic unit of Venice: in each campo you will see a well, often beautifully made from architectural fragments. Collecting fresh water was crucial in this city, and here the medieval Venetians show their cleverness. They sloped the campi to catch all the rainwater from surrounding streets and roofs; as the water tricked in it was filtered through layers of sand before arriving in the huge cisterns beneath the wells. On your first walk around, you’ll notice that neither the streets nor the canals seem to have firm intention of leading anywhere. The canals are as much boundaries as traffic routes, and the streets are meant only to connect each part of the block with its campo. The design, where facilitating movement was thought less important than establishing a sense of place and identity, gives Venice a peculiar cellular quality; it was inspired by the Greek and Arab cities of the early Middle Ages. There are many echoes of old Constantinople in Venice’s layout. The Grand Canal mirrors the famous Meze of the imperial capital, a great street neatly dividing the city in two; at the foot of each city is the all-important square, with a view over the water on one side—Piazza San Marco in Venice, or the Golden Square in Constantinople, containing both the religious center (St Mark’s, the Hagia Sophia) and the symbols of the state (the Doge’s Palace, the Imperial Palace). 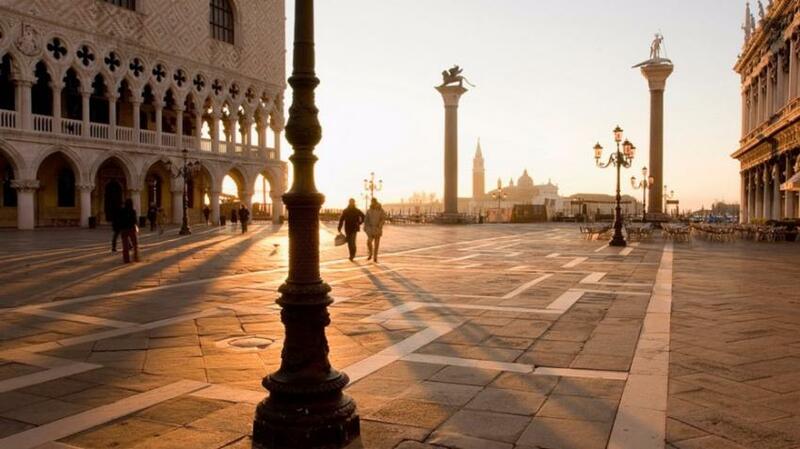 Piazza San Marco is, by popular acclaim over the centuries, the finest square in Europe. It is so not only for the sumptuous buildings around it, but for their arrangement, the textbook example of medieval urban design. The key to it is the integration of the main buildings, St Mark’s and the Doge’s Palace, into their surroundings, instead of leaving them isolated and open as a modern planner would do. Their intrusion into the square creates smaller, complimentary spaces—the Piazzetta dei Leoncini and Piazzetta San Marco—and a subtle three-dimensional composition that offers differing, equally exciting prospects from a multitude of viewpoints. Instead of infantile symmetric geometry, the composition is a carefully considered artistic whole. You can see other variations on this theme at Campo Santa Maria Formosa, Santa Maria dei Miracoli, Santi Giovanni e Paolo, and around the Frari. Consider the Venetian house and what it takes to keep one standing–a solid platform of wooden piles, driven into the mud. Some of these have stood their ground for a thousand years. In the old merchants’ palazzi, the windows give a clue to the plan inside. On the ground floor, there was always one large hall running the length of the building, where business was transacted; directly above it, where the Byzantine-Gothic fenestration is at its loveliest, was another hall, the main room of the piano nobile where the family lived and entertained. The most impressive façade always overlooked the water, and the main door would alays be the water door, often marked by gaily painted moroing poles, or pali; Venetians lived in their boats the way modern city dwellers live in their cars. On top, you’ll often see surviving altane, the sun terraces of the ladies where they would bleach their hair to achieve the desired Titian blondness, along with a few old top-heavy chimney pots, designed to limit the risk of fire, a characteristic feature that the city’s Renaissance artists loved to incorporate in their paintings. One thing you won’t often see is a family coat-of-arms over a palace: the republic usually forbade such displays of vanity. There will be stone winged lions instead, several thousand of them in all, and also plenty of unexpected and random decoration: a haughty Byzantine emperor, probably stolen from Constantinople in 1204, frowning over a tiny courtyard, a duck, a griffon, a pair of 6th-century capitals, a shrine to Persephone erected by a scholarly Renaissance humanist. For a city built on water, it's not surprising that Venice has more leaning towers than Pisa, or that many have simply collapsed over the centuries (including the mighty Campanile di San Marco, which tumbled down so gently that the only casualty was the keeper's cat). Human casualties in this once densest of cities were not uncommon. Today the authorities keep a very close eye on the tilters: San Giorgio dei Greci, Santo Stefano, and San Pietro di Castello as well as San Pietro Martire on Murano and San Martino on Burano). Recently the campanile of the Basilica di Santa Maria Assunta on Torcello has been restored, offering views as unique as the other towers you can climb: St Mark's (rebuilt) bellower, San Giorgio Maggiore and the Torre dell'Orologio. Then there are some 400 bridges, from the grand Renaissance Rialto Bridge and the original Bridge of Sighs (there are several others around the world, including one in Pittsburgh, Pennsylvania) to the tiniest little canal-spanning walkway leading to someone's front door. Originally they were all made of wood, until a massive fire in 1106 turned them to ash, and the city was built of stone.